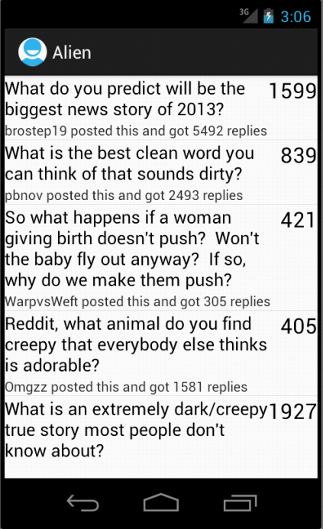 There are so many popular Reddit clients for Android out there like Reddit News, Bacon Reader, and Reddit is Fun. You might have sometimes wondered how they are made. Well, today we will be making a very basic Reddit client. First of all, you need to know that Reddit exposes an API using which you can perform activities like fetching posts, fetching comments, voting, commenting et cetera. Today however, we will just be using the fetching posts part of the API. Not asking for much here. You just need to know how to create an Android project in Eclipse, and know what activities and fragments mean. I guess anybody who knows XML will understand JSON. If you understand what key value pairs are, you already know some JSON. Now create your Android project, and then we write some code. * set to your requirements. The class is pretty self-explanatory. The readContents() method accepts a URL and returns a String, which contains the contents of the URL. This method of course, cannot be used to download binary data like images, but for the JSON API, it works perfectly. Next, we need to create a class that represents a post. It should have properties like those that are present in the JSON data. * returned by the Reddit API. +" posted this and got "
* We will be fetching JSON data from the API. * subreddit name and the 'after' property. * Reddit using the JSON API. Okay, till now this has been pure Java, and you can use these classes anywhere to make a Java based client. So, those were the XMLs. Like I said, this is a very basic (and possibly not very good-looking) client. Now, we will create the Fragment. All it does is, use the PostsHolder class to fetch the posts and then render those posts in a ListView. We need to separate the UI related parts of the code from the functionality so that our app can handle orientation changes efficiently. * actually does is load the posts in to the listview. // thread. So create a new thread. * , and assigns it to the list. // Make sure this fragment is still a part of the activity. Phew! That was a lot of coding, for albeit simple functionality. Java is a verbose language, and so is the Android SDK. Let me know what you think of this tutorial. There are a lot of optimizations that can be done, and a lot more functionality is to be added. Part II of this tutorial is coming soon, where we will implement features like a caching mechanism and a slide to change the subreddit. Read Part II of this tutorial now. If you want to implement Reddit sign in, I suggest you also take a look at my new article that shows you how to work with Reddit's OAuth 2.0 flow. Hi there! Thanks for the great tutorial, one question though... post_item doesn't seem to be included in your xml but you refer to it in the fragments class. Was that just a mistake and it should be in there? Thanks for the guide! I figured it out, for those that are interested. In the PostsFragment class, within createAdapter, the reference of R.layout.post_item should be R.layout.post. Hathy must have changed the name of his post.xml and forgot to switch it here. :D works like a charm. I hope the third tutorial can teach a little about how to dive into a post and retrieve the comments. Thanks so much for your help! Thanks Carter. I have edited the post to add your correction.